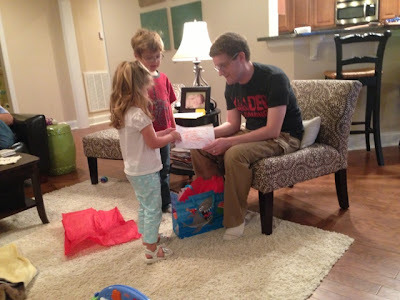 Andrew turned the big 29 last Thursday (ok, 29 isn't that big except for the reminder of what next year is...). He had the day of his birthday off and got to hang out with Perry all day. We had a family party for him last Saturday night. It was low-key but fun. We ate bbq, played games, and had cake. Andrew decided he wanted camping stuff for his birthday. After we all got over the shock that Andrew wants to start camping, we went shopping. Perry and I got him an awesome tent and his family got him other necessities like a frisbee, smores skewers, and some giftcards to dicks. Our nephew Ben decided he wanted to get Andrew movie tickets to see Iron Man 3. It was so sweet that he thought about it and picked out a gift. Andrew was excited (and I am just hoping he finds someone else to go with...lol). 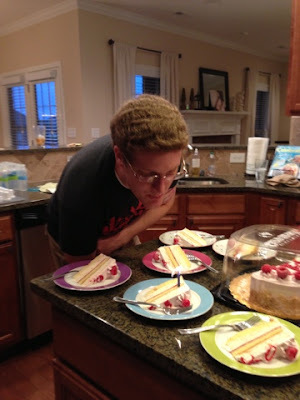 Andrew loves ice cream so his favorite kind of cake is ice cream cake. When I showed him the Coldstone cake menu he picked out the raspberry cheesecake, to which I asked "are you sure you want a pink birthday cake?" Andrew answered yes (and something about being secure enough in his manhood to have a pink cake if he wants one) and so here it is. It was very yummy. Good choice Andrew. It was a fun night. We played games and talked way into the night. 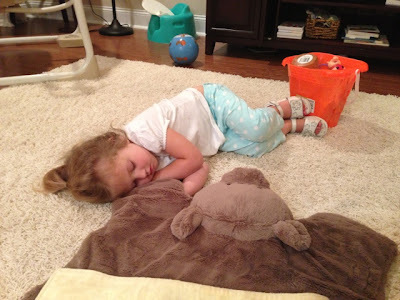 So late that sweet Kate gave up on going home to sleep in her own bed and made herself a little bed with Perry's bear rug in the living room floor. 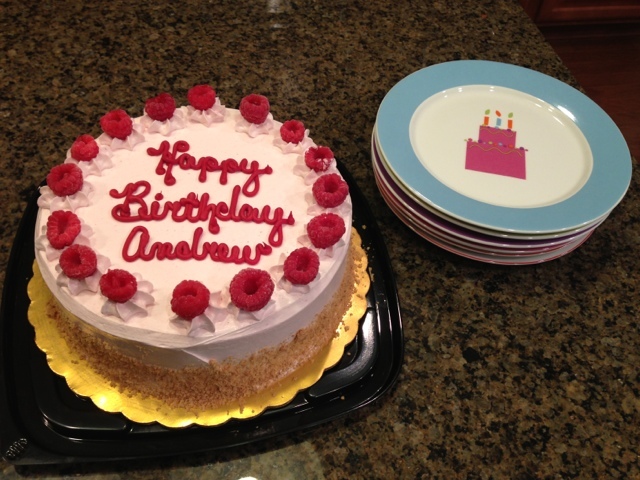 Happy Birthday Andrew! One more year until the big 30.